Karen Dakak helps student Nicholas Barros draw a shape on the iPad. When the Mendham, NJ, Rotary Club donated two iPads to Matheny, the primary purpose was to enhance the communications ability of students who were restricted to their homes or hospital rooms due to illness. 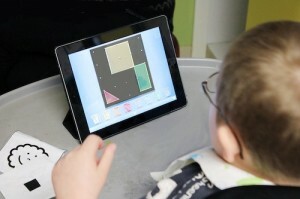 Videoconferencing technology permits children to attend class remotely, even when they are sick or avoiding contagion. The iPads are especially valuable to Matheny students because they are less cumbersome to hold than laptop computers, can be used with inexpensive apps designed specifically for people with disabilities and offer touch screens that provide greater accessibility for those with little or no fine motor control. This is but one example of how the Matheny School uses technology to help its students reach their highest level of academic achievement while also obtaining maximum independence. Three different shapes on the iPad screen. This entry was posted in Uncategorized and tagged iPad, Mendham Rotary. Bookmark the permalink.